Discussion in 'Dovetail Live Article Discussion' started by TrainSim-James, May 1, 2018. Nice that it is the West Somerset Railway in a first try guess. But a little disappointed that there aren't gonna be any steam locomotives on this route. Brilliant! Will there be different liveries for the 47s and MK1s? And what type of coaches are included - compartment compatible alongside windows inside? If you were going to make the West Somerset Railway, there should be at least 1 steam train included. Me and i'm sure a lot of other people too are going to be let down by this and I don't blame them. If you were not going to make any steam trains, you should of picked another route to make in my opinion. Britains longest Steam heritage line comes to TSW with sweet FA Steam engines! Absolutely Disgusted where are the steam trains!! I get this - I mean i too wish for steam - BUT, this provides the perfect route for steams introduction when it is ready to be implemented. Steam might not be ready yet, but having an established route like this already in game would make their addition much easier. I know it might not be ideal, but maybe view this route as Steam in TSW v0.1? A hopeful but unlikely thought: the gronk would be used as a testbed for coupling rods required for steam engine simulation. Additional thought: They listed the exact numbers of the locomotives. Are we getting only two locomotives in total for the entire route? I get it's mostly a single-track route, but that's still way too few... not many services I could imagine for that. Well, interesting, but still - not a german route. So I will hold back till it came (theoretically next release for TSW should be with german stuff), like I did with NEC. Still fingers crossed for editor and multiplayer for HH, GWE and RT. Agreed. As well as this being set in a diesel gala, the line would be packed full of engines with all passing loops being used. Not just Williton like this will be. Like many others, I am disappointed that there aren't any steam locomotives in this dlc. However, I think that the Class 47 and Class 09 are great choices for the first preserved diesel locomotives. Also, will there be a Twitch stream or video footage of the route before release? Well, they say that they would "lead the way" so, maybe we're getting more? Although, I can't imagine many more new engines added, so maybe some Class 66's? Don't know. Yes, I know. That's the only british loco currently modeled in TSW, which is why adding them would be easier. Class 66s aren't preserved and don't operate on the West Somerset Railway. They still only operate on the mainline network. Okay, but two locomotives is way too few for an entire route with scenarios and service mode. Poll for WSR steam locomotives I've set up. You can vote for any of the three operational locomotives on the West Somerset Railway. I asked Matt this - about AI, or lack there of - answer: some creative license, and some stations open to 2 track. That's a GBRf class 66 which was just used for the gala before returning to main line service. At most galas, heritage railways outsource rolling stock as they do not have enough locomotives themselves. I see. But we are supposed to be "during the middle of its annual Diesel Gala" so I suppose this won't be out of place, would it? Plus this particular shed is apparently called "West Somerset Railway" so, eh? The problem is that this loco is a GBRf loco. 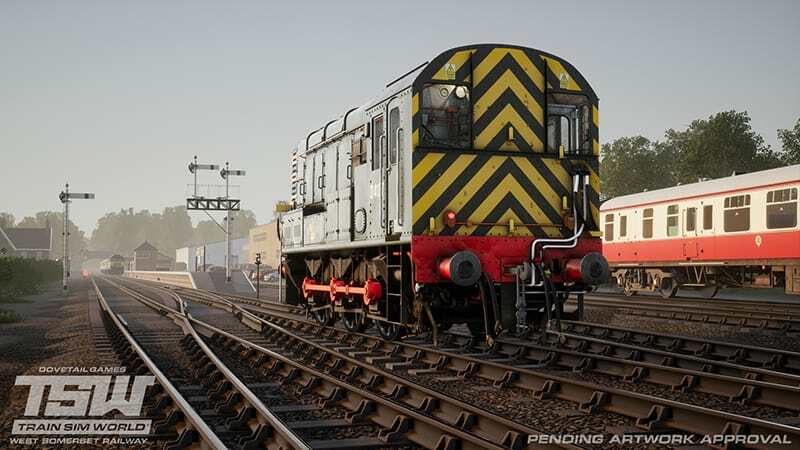 Dovetail Games doesn't have a license with GBRf so they won't be able to add this. Well, you must realize that not everyone that gets this route will have GWE. Even with NEC they didn’t use the SD40-2 or AC4400CW despite the fact that everyone has Sand Patch because not everyone will have Sand Patch in the future. They are not going to make a route require another route, and I don’t find it likely that they would make multiple service mode timetables just to throw in a 66. Maybe if they had another route with some GWR Hall Class they would make another services timetable to use that steamer for those who have it, but a 66 is nowhere near as important to the heritage line as some GWR steamer would be. You are thinking about it from a wrong angle, pschlik. They don't need to throw in a 66 to have an 66 on this route. They'd probably need to throw in a 66 to have more stock on the route, because otherwise they won't have enough, and unlike any other BR locomotive, class 66 is already fully implemented. I'd imagine that if you don't have GWR, you still would get a shed. EDIT: As an example: both GP40 DLC and NEC add centerbeam cars, so you can get them by buying either DLC. Why isn't this a possibility with locomotives? I agree with you ayrton. The wsr without a steam engine does seem half done. Mind you that’s just me speaking as a steam fan. With steam engines I would buy this. But with diesel only I may skip this DLC. Well, that's not much... And apparently that's indeed just two locos. I suppose there are multiple of them though, but still quite meh. Just one of each locomotive as stated at the bottom of the article. The article just mentioned one of each locomotive. It wouldn't look good if there were two identical locomotives with the same number and same name plate on the route. The article doesn't say that these are the only locomotives on the route, though. It would be a suicide to release a DLC with just two locos for services and scenarios for the entire route. Really? ECML-S came with Class 365 and HST. Riviera Line came with 143 and HST, Liverpool to Manchester came with a 158 and QD only Class 47, Isle of Wight came with 483 EMU or 0-4-0 ST steam - I think you get the picture, clearly it isn't suicide to do such a thing. Once again, I'm talking about a route with literally TWO LOCOMOTIVES, not two TYPES of locomotives. That should be apparent from the discussion preceding the post you quoted. If you want BR diesels, do a BR Diesel Era route. If you want heritage to get sales then bother to put in the star attraction at heritage railways. When will DTG learn that people want steam locos in TSW, and more of them in TS? It's not that it's not possible, its that it's not what DTG does. The entire reason both the NEC and GP40 have the centerbeam is because it a centerbeam is 'at home' in both contexts and it saved dev time to recycle. The 66 on the other hand doesn't make sense in this context as a 66 is not at home to the WSR-literally. The WSR is home for D1661 and D4107, and a ton of other things in that video, but not any of the 66s. You might as well put the HST in there, because HSTs have visited the line on occasion, but things like that are so anecdotal they might as well be down to custom scenario creation. I'm sure if DTG was able to create a high quality steamer for TSW right now they would release it with this route. But as it stands I'm guessing their steam simulation isn't a 100% yet. I'm sure once they have made a quality Steam loco they will (not might) release a DLC with it. Was kinda hoping for a Pacific Surfliner route when I saw the title, but this still looks pretty interesting. I'd give it a try, providing DTG learned their lesson from the disaster that was NEC New York. Are you listening to the overwhelmingly negative reaction to this next DLC by virtually every single poster on every single forum you choose to go on? How much longer can you stick your head in the sand and pretend that people are happy with what is being produced? I’m not sure but I’m assuming you think we’re all stupid? No fixes/development (announced at least) for the existing content which is desperately waiting to be fixed and expanded. You then choose to release the shortest route yet that is already available in 2 different guises for Train Simulator. Given the route length and number of included locos I assume this will be cheaper than the other DLC? This route is a heritage route where the main attraction is steam but it’s nowhere to be seen. What is the worst thing for me though is there is no fessing up and saying ‘sorry guys and girls but it’s not ready yet, it is coming though’. Instead you expect us to join the fantasy bandwagon and ‘pretend’ that it’s set during a diesel gala...who do you think you’re fooling? I’m so willing you to make TSW everything it should and could be but it seems you’re hell bent on blowing your own feet off. Lastly, please whatever you do, DO NOT release this unless it is ready. No one expects software to be entirely bug free but if people are picking up glaring c o c k-ups within a couple of hours of release again then I really fear for the future of the franchise, and that is a sad thought. The next dlc looks nice/ok, but I won't judge it before we see some more and hopefully listen to the sounds. I hope DTG will get better with sound quality. We shouldn't be arguing about what traction is or isn't included in the route, there should be a game mode that permits users to use whatever traction they like on any given route, as well as scenario creation tools. These things were standard in MSTS, Trainz and Railworks. "Free Roam" or "Quick Drive" game modes would be relatively easy to code and implement if the game itself has been properly coded. So the question is why have they not been implemented? Is it a conscious decision by DTG to omit them, in which case I'd be interested to know why, or has the base game been developed in such a way that they can't implement them with any level of reliability? If the route is true to life then Crowcombe ,Washford and Blue Anchor also have passing Loops.